Following last month’s successful website survey – and a big thank you to everyone who provided valuable feedback – we have just published a new leaflet examining cognitive dysfunction; an all too common and often debilitating symptom. Often referred to as ‘brain fog’ by people with ME/CFS, cognitive dysfunction is how doctors refer to problems with normal mental functioning – concentration and short-term (working) memory in particular. It’s a worrying and often very frustrating part of having ME/ CFS. The symptoms can fluctuate and vary from mild to severe. The cause remains uncertain and there is no effective form of drug treatment available – although self-help coping strategies can be helpful. The new leaflet is now available from the website shop. Short-term memory – sometimes referred to as working memory – refers to information that has been passed to the brain via your ears or eyes within the past few seconds, minutes or hours. So, it mainly relates to things you have recently been told, or been asked to do, or are about to go and do. 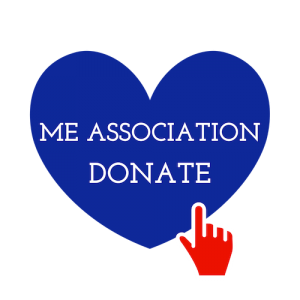 Cognitive dysfunction in ME/CFS does not normally affect medium or long- term memory – so recall of information and events from weeks, months or years ago is not normally a problem. Problems with short-term memory and poor concentration inevitably lead to other cognitive difficulties. Therefore, people with ME/CFS normally find that their attention span becomes shorter; they have difficulty with processing, storing and retrieving information – especially during conversations; and they cannot do more than one task at a time when it comes to mental activity. On the other hand, it’s reassuring to note that cognitive dysfunction in ME/CFS is not a progressive or dementing process. And there isn’t normally any significant effect on higher mental functions such as intellect or IQ that inevitably start to progressively deteriorate in any form of dementia. From the research point of view, there is no evidence that cognitive dysfunction in ME/CFS is associated with the sort of progressive loss of vital brain tissue (cerebral atrophy) that oc­curs in dementia. How common is cognitive dysfunction in ME/CFS? 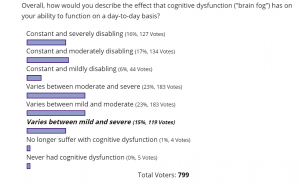 Most doctors regard cognitive dysfunction as a very characteristic feature of ME/CFS and would be reluctant to make a diagnosis of ME/CFS in anyone who does not report this key symptom to some degree. People with ME/CFS normally report that cognitive dysfunc­tion forms a very significant part of their range of symptoms. For some, it’s the most debilitating and frustrating part of their whole illness. Just like other ME/CFS symptoms, cognitive dysfunction can be very variable and may well fluctuate according to how you feel generally. Website survey results on cognitive dysfunction (March 2019). So, in the same way that too much physical activity will quickly produce muscle fatigue, prolonged or intense mental activity will bring on or exacerbate brain fatigue and the cognitive problems that accompany it. But physical activity will also produce cognitive dysfunction. 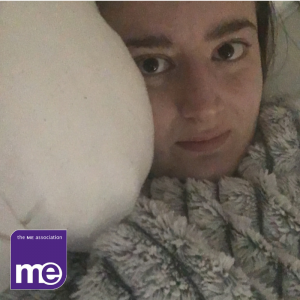 Other medical problems such as frequent headaches, pain, sleep disturbance, anxiety and depression can all cause cognitive dysfunction – regardless of whether or not you have ME/CFS. So, if any of these are present, they are likely to be exacerbating the problem. Some types of medication can also cause cognitive dysfunction as a side- effect. 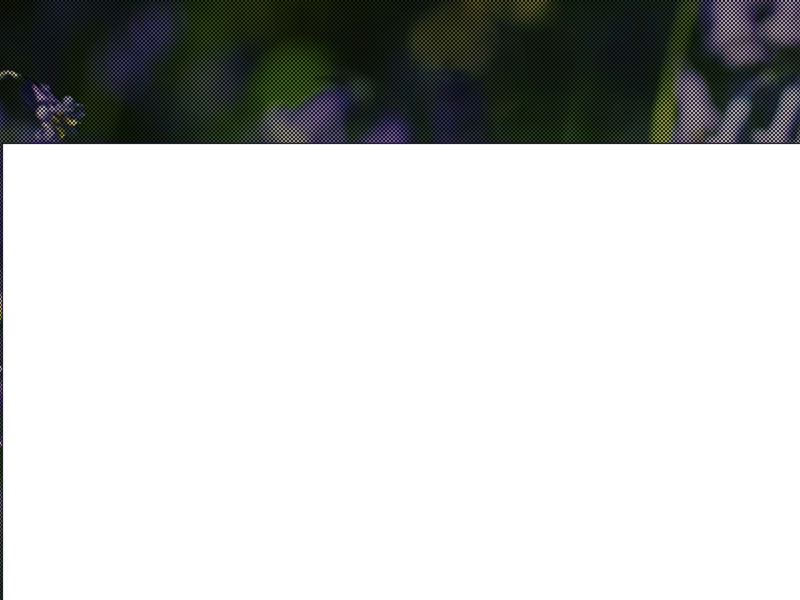 Examples of drugs that can cause cognitive dysfunction and may be prescribed to people with ME/CFS include anticholinergics (drugs that are used to treat an overactive blad­der, nausea and breathing problems), anticonvulsants, antidepressants, hyp­notics and sedatives, non-steroidal anti- inflammatory drugs (NSAIDs) such as Brufen/ibuprofen and steroids. 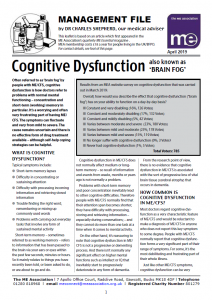 This new leaflet on cognitive dysfunction written by Dr Shepherd provides an excellent summary of this debilitating symptom and how it affects people with ME/CFS. It examines the research that has been conducted, the causes that have been identified, reviews management approaches and looks at pacing mental activities. Also, practical tips, a review of Co-Q10, drug treatments, complementary and alternative approaches and a ‘To whom it may concern letter’ to help you explain cognitive dysfunction to other people like, for example, your GP. The leaflet is now available to order in hard-copy or to download from the website shop.